The ACA Enrollment Survey is Here! The American Camps Association (ACA) has released their Spring 2011 Enrollment Survey, reflecting the trends and opinions of camp directors everywhere. Over 80% of respondents felt enrollment was higher or the same as this time last year. Enrollments at resident camps were promisingly up 51% (compared to 45% last year) and 43% at day camps (up from 35% last year). Requests for financial support also seemed to level off. Nearly 50% felt they were the same as last year and only 30% felt they were higher than last year (compared to 45% last year). Though despite the positive snapshot of increased enrollment, many camp directors still expressed concerns about staying competitive with other summer options and parents waiting until the last minute to enroll. Do you feel these results reflect your enrollment trend this season? Be sure to look out for the ACA's Fall Survey to share your experiences with the camp community. Marketing your camp on MySummerCamps and KidsCamps is a great way to reach a wide audience of potential campers. We can help put your camp in front of thousands of parents searching our camp directories every day. Contact us at 1-877-777-7738 or [email protected] today to start building your advertising strategy! Natural products company All Terrain wants to promote and support programs that get youth active and that protect open spaces for generations. All Terrain Cares is their way of helping programs get the word out and to support those programs selected by the community with small grants. Camps with an active outdoor component are eligible for these grants, so apply now! After submitting, all camps have to do is gather the most votes to be awarded a grant. The next submission deadlines are June 30, 2011 and July 29, 2011. "Like" Our New Facebook and Enter to Win! MySummerCamps and KidsCamps have relaunched our Facebook page as a resource for parents & campers as well as a place for the camp community to promote scholarships and share memories. To kick off our new Facebook presence in style, our good friends at TruKid are co-sponsoring a special giveaway for parents and campers. "Like" our Facebook page to enter to win a prize package of their all-natural skin care products for kids, valued at over $100! Pass the word on to your campers! 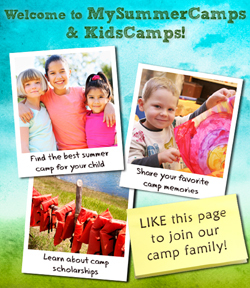 Click to visit the new MySummerCamps & KidsCamps Facebook page and join our camp family today!